for this tutorial I really wanted to find a way to get hot 3D text without using a 3D dedicated program. First, I added a stroke to the logo so that the extra outline will serve as a bevel to my 3D text once I’ve kicked into the project. I changed the logo fill and stroke to white. I’ve found that when I apply Extrude and Bevel, white is the best choice to get crisp whites and blacks in the 3D text. I adjusted the settings for the Extrude and Bevel. I clicked on options to get more settings and adjust the Light Intensity and Ambient Light to get my bright whites and dark blacks. The position of the light on your text is the key to removing the gray areas. The results of the 3D extrusion in Illustrator are now copied and pasted onto a pink background in Photoshop. I ran into a glitch area in the 3D extrusion that caused me to have to fill in the area on the V.
I choose Select/Color Range to choose just my white areas. I copied that layer and selected the inverse. I deleted the inverse so that only my white areas are on a layer by themselves. I still have a copy of the logo on it’s original pasted layer, as I’ll need that later in the tut. I copied the layer that has my white logo on it and made a selection of everything on the layer. Then, I contracted the selection by 10 pixels or so and deleted the inverse. I chose Edit/Fill and filled my layer with a 50% gray so that I can see the difference between my two layers. The outside white that is on it’s own layer will serve as the outer bevel. The gray area that is on a layer above will be the face of my 3D text that will contain the majority of my reflections. 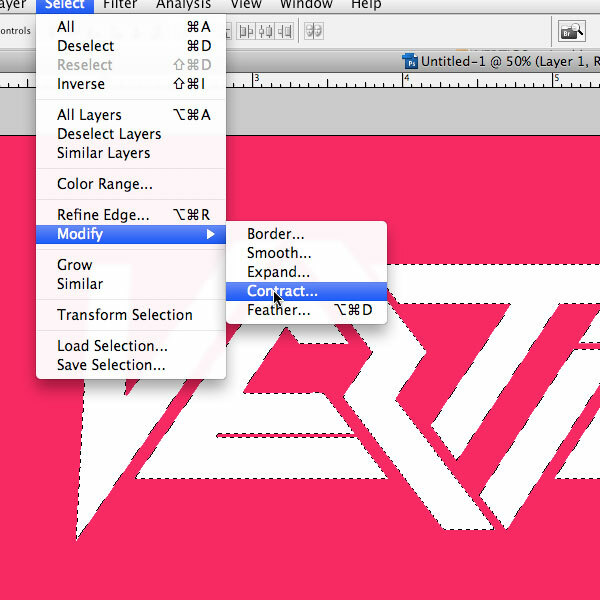 I added a Gradient Overlay by clicking the FX button at the bottom of my layers panel.